When you're travelling, maintaining your image is likely to be the last thing on your mind. Of course you want to look good, but generally comfort will decide the clothing items you pack and wear at your destination. Travelling alone also means that all of your travel items will be carried by you, you can't share the load with another holiday maker, so only pack essentials. A primary factor to bear in mind when packing, is climate. No matter where you choose to head for - the weather will generally dictate what you will be required to pack. If travelling somewhere sunny and humid you will need to travel light, so pack versatile items that fold away, are light to carry and serve many purposes – like a sarong for instance. 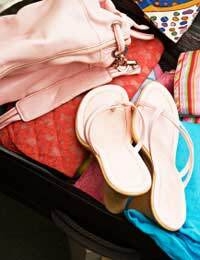 Multi-purpose clothing, accessories and products do the job of more than one item and take up considerably less space in your luggage. Packing a number of light-weight, foldaway items also means you have more space to bring back souvenirs of your travels, and will also ensure you don’t have to endure the additional hassle of carrying bulky baggage whilst travelling. The best clothing items to consider are wrinkle-resistant, adaptable, light-weight, washable and co-ordinate well with the majority of the other clothes you pack. Disposable items and travel-sized toiletries provide all the essential uses of a larger-sized product but take up considerably less space. Where possible buying the products at your destination will also save you money, so it is only worth packing favourite items or those you know you will have difficulty finding. If you are travelling to a sunny beach location, pack a plenty of swim shorts, swimsuits or bikinis. These are lightweight items that can be packed inside shoes to save on packing space. Bear in mind though, that in some countries, it is considered unacceptable to walk around scantily-clad. To avoid unwelcome attention, check to see what other people are wearing before you bare all. Since you'll be on your own, pack a mobile phone so you can keep your loved ones updated with where you are. Also a torch, water bottle and whistle are handy in case you get stranded or in trouble. Cruise packing requires insider knowledge. Find out whether you will be expected to dress for dinner in the evenings. If so try to reduce your luggage by packing outfits that you can adapt. A black sarong made of some slinky fabric that you can change from a halter neck dress into a strapless one, or mix with a different colour belt or scarf is ideal. Pack lots of different accessories too, they will take less packing space than clothing. For the daytime you might spend a lot of time in swimwear and a cover-up, so packing for that should be straightfoward. Pack a few pairs of smart shorts or skirts to pop on when you're on shore visits and don't forget several sunhats and something to cover your shoulders. Rubber-soled shoes are an essential item if you are spending time on deck. Mix-and-match clothing will easily take you from daytime to night-time, as all you will need to transform your look is a few smart accessories. Remember also to pack a sweater or shawl for evenings. All cruise ships offer the facilities of a complimentary self-service laundry, so should your clothes require smartening up this option is available.